I’ve been lusting after a beautiful home office space for rather a long while now. But so much more so once I’d well and truly been bitten (and smitten!) by the blogging bug of course. Nowadays, sitting in front of a computer screen at work, and then at home in the evenings or at weekends has become my new norm. So it goes without saying, I could really do with a dedicated space in which to do this. In our current house we’ve never had a dedicated home office as the rooms have all been used for other things. The most obvious room of these was that of the box room, which was, until just before Christmas, used as Ella’s nursery. But now that she has moved in to a new room with her big sister, the room can be reutilised for what we’d always intended it to be. We’ve taken out all the furniture and taken down decals from the walls, and refreshed the room with a lovely new and bright lick of paint. So I have my blank canvas. Now it’s time to fill it! We’ve lived in houses which have had studies before, but they were never really used to their full potential or for a particulatr reason. I wasn’t blogging back then and neither myself nor my husband really had the need to work from home, so the office space became more of a dumping ground for old paperwork, redundant files and general odds and ends which never really had homes of their own anywhere else in the house. So this time round I’m excited. And you can probably understand why. This time round I have a pretty good vision of what I want. And I can see exactly what I need from the room too. I want it to be functional and beautiful and simple. I don’t think I want to over complicate the space by adding too much clutter. Though clutter, I’m afraid to say is sort of ‘my thing’, (though it’s on my 2016 goals list to rectify this!) so, obviously I will need plenty of storage. I want different types of storage to suit my needs. I want certain items to be hidden, other items to be on view or showcased. I want it to be a beautiful space though too, where ! can shut myself away and feel comfortable and content, which I’m sure will help with my creativity. Hmmm, perhaps I’ll need a lock on the door to keep the kids away too! 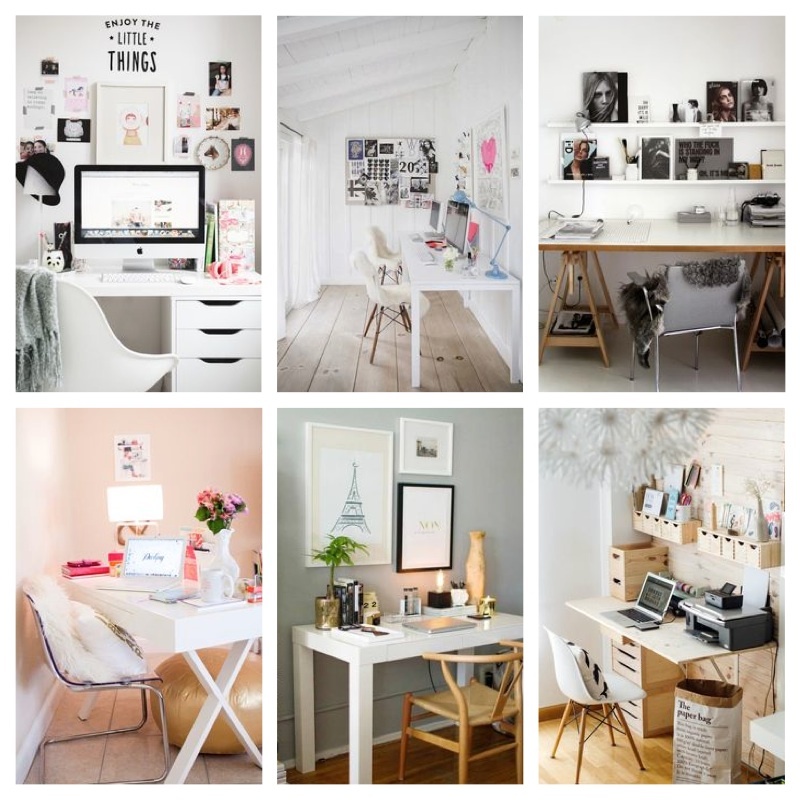 There are so many beautiful ways to style a home office nowadays, the world really is your oyster. And it seems that perhaps 2016 is the year of the home office too. Many of my blogging bests have begun to look at office spaces too, but perhaps it’s because we have all found something we love doing, something we want to make a go of, and therefore we want somewhere lovely in which to do this too. I have a rather large collection of ideas on my Pinterest board, that much loved app which I’ve found invaluable for inspiration, tips and advice. Now though comes the trickier bit, whittling it down to just a couple of ideas as I can’t fit them all in the same room now can I! I love the look of this office space above. I love the deep and distinctive tones of the natural wood and the tiled floor, with the cute pop of vibrant pink. To me it looks warm and inviting, and somewhere where you’d feel comfortable to spend a days blogging! Or internet shopping of course! I particularly love this chair. It’s not your typical office chair, but i love it none the less. And it seems to be taunting me as it’s popping up in so many things I read. I really, really want it! Ok, so this isn’t exactly a view of an entire office space, but I can see what I want to achieve from my own space through this image. 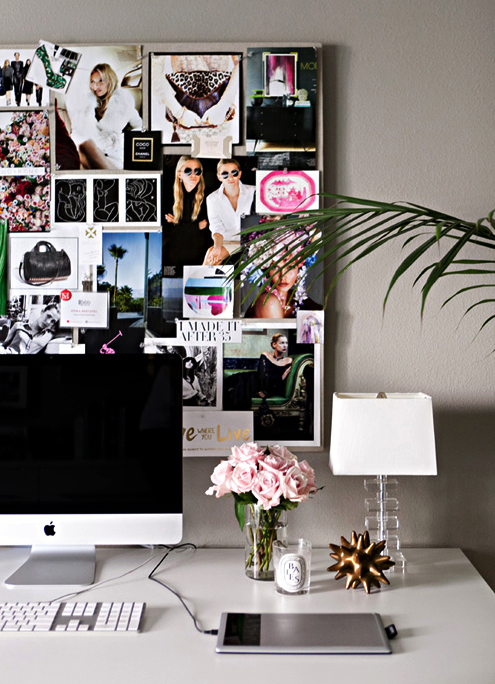 I love the mood board placement above the desk so that inspiration is constant. I also rather love the grey tone to the wall, a colour I think we’ll be seeing lots more of in 2016. Oh look. It’s that chair again! You see! I need it! 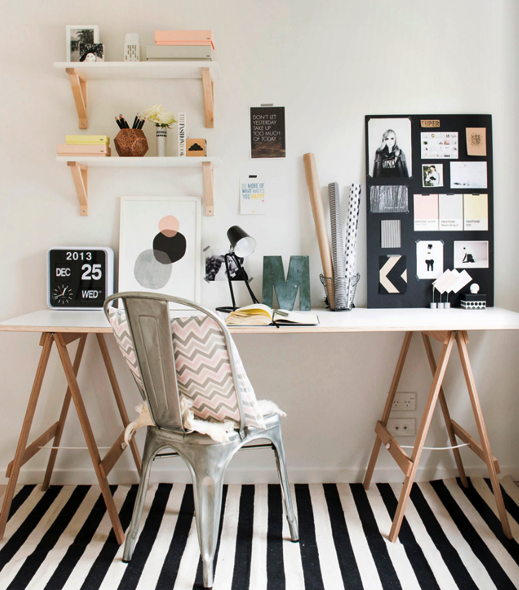 I really love this desk space as it looks very clean and simply styled. With the bare canvas of the white and the walls, it would be easy to update this each season with key looks or to add little pops of colour here and there to brighten things up a little. This one I love because of the modern ‘scandi’ type of feel I think the room has. I’m really into this trend at the moment, and it’s something I really want to incorporate more of into my home, especially with the new developments in store for our kitchen/dining room. So, there you have it. I like so many styles, so now it’s just time to pick a couple and see what suits me best. 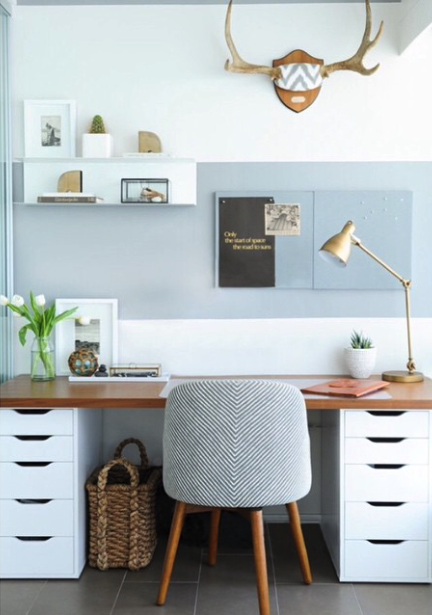 Do you have a dedicated home office, or even an workspace in another room? How have you styled yours? Why not check out my Pinterest board here for some more ideas..
Oops. Sorry Heledd!! You’re first priority is the nursery now though !! ??? It´s been hard for me to keep my office space clean. Specally as a mother of 3 kids. But I think an explanation of why they should stay away from my place has been pretty useful. What specific words so you use to keep them away from a place like this?